Another week has slipped by. We had a couple of doctor appointments. It's a rare week when we don't have at least one. We live about thirty minutes outside of San Antonio - so every appointment or errand is a bit of a trip. Our odometer is constantly spinning. The trade-off is living on this peaceful five acres of land. I think I can even hear the car breathe a sigh of relief when we turn into our driveway. When we get to spend a whole day at home, I am in my happy place. Our choir sang on the steps of City Hall this past Thursday as part of the National Day of Prayer. We were a little late getting there and had to park a couple of blocks away. As we walked toward City Hall I could hear them. It's a unique experience to walk down the streets of the city and hear praise music filling the air. One afternoon, I did a bit of investigating. 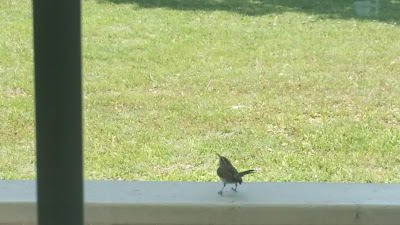 The baby cardinals had flown the nest, so I thought it was safe to take down the hanging plant. Sure enough there was a tiny nest on the bottom of the pot. No wonder the little wren felt put out. All that effort to build her nest only to be evicted by her uppity neighbors. Mother's Day always makes me feel a bit squirmy. I'm learning to set aside those feelings of "not enough" and embrace the sweet cards, gifts and phone calls - but it isn't always easy. I am overwhelmed by the grace that takes my feeble efforts and makes something so lovely. We celebrated on Saturday with the kids and then on Sunday we spent the day at the Assisted Living with my Mom and Dad. We decided it would be much easier for them if we got dinner and brought it to them. So I packed a basket with place mats. napkins, dishes and silverware, and we went to their favorite Italian restaurant and got dinner-to-go. We sat around their little table and had a sweet time. They are so grateful for all we do. After dinner, instead of sitting and trying to make conversation (which can get to be a bit of a struggle these days), we brought the Dominoes. Mom and Dad introduced us to the game, and they've always loved playing. My Dad is extremely competitive! It was bitter-sweet. They had a hard time understanding the rules and kept apologizing for their confusion. Oh, these days can be hard. 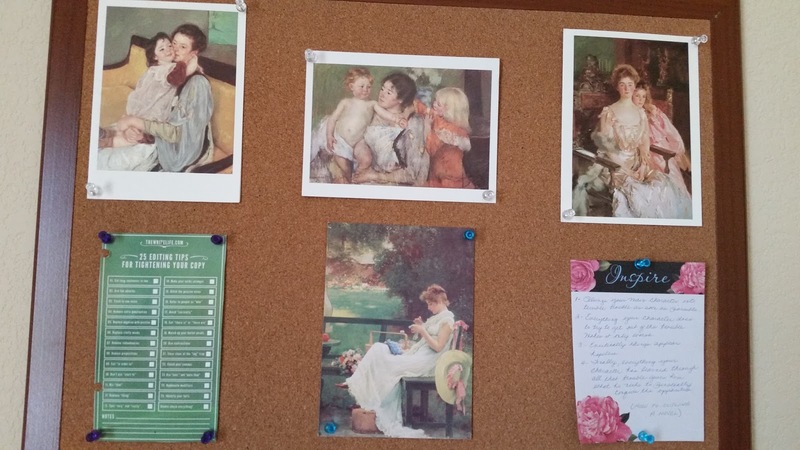 The other day I decided to put the notes my Mom had sent me years ago on my bulletin board. 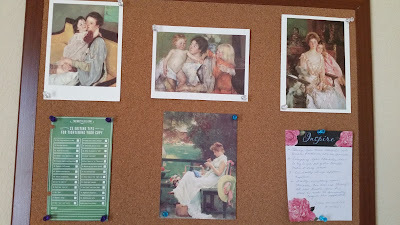 Her favorite artist is Mary Cassatt, and she loved these note cards. Before I pinned them to the board, I sat and read through the notes inside. How could I have forgotten how bright and witty and talented she is? This precious woman who struggles to remember names and dates and repeats the same things over and over again. We have come full-circle. It's my turn to give grace and love with patience. She has always done that for me. I have been mulling over thoughts for a post. I'm not quite ready to write it and don't know if I ever can. I've been considering the holiness of God and the love of God. Is it possible to get them out of balance? Is it possible to be so zealous in love it causes us to diminish His holiness? I'm out of the boot! My foot swells up like a little sausage by the end of the day, but I'm making progress. I have a check-up on Wednesday. I told you it's rare for a week to go by without doctor appointments. My husband had his eye appointment this afternoon. I always walk into the retina specialist's office with pounding heart. Thankfully his eye, his only eye, is stable. Back in two months for a follow-up. I can breathe easy for a while. Thanks for visiting. I'm grateful.